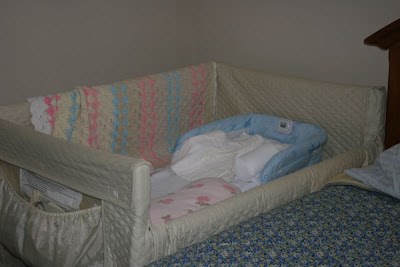 A Chair of Bowlies: Ephraim's "Nursery"
As is tradition with our babies, Ephraim sleeps in the co-sleeper in our room. 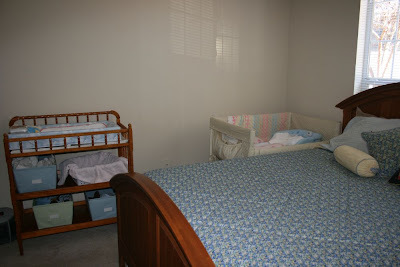 However, in our new place, we aren't nearly as close to the kids room and therefore- the changing table and cloth diapers! This has made life a little bit difficult when it comes to those middle-of-the-night diaper changes. We also had no place to store Ephraim's clothes! We were in a bit of a fix. The View as you come in. Right side of the room is empty. 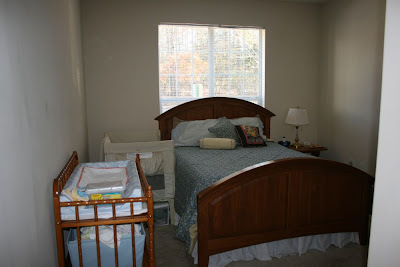 Left side is the nursery area. The co-sleeper. We recently bought the Deluxe Snuggle Nest which you can see there in the co-sleeper. I had wanted it for a long time and I love it! 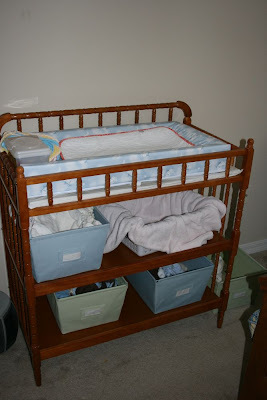 You can move it around anywhere-- in the bed or in a crib or in a bassinet- anywhere! We bought a cheap and small changing table for our room so we could change diapers and have space to store his clothes and diapers. It's working really well so far! Fun huh? Looks like our room right now. We even have the same style changing table, except in white.